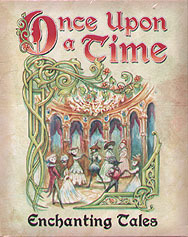 In Once Upon a Time, players tell a story together using cards that show fairytale elements and endings. Now add more magic to your game with the Enchanting Tales expansion. Inspired by enchanted princesses like Cinderella and Snow White, the cards in this set can be shuffled into your deck to add new themes and more variety to your game. For an even stronger magical feel, try removing some of the core game's Story or Ending Cards.